The following Crypto Trading Guide is focusing on all the elements and basic concepts of Cryptocurrency trading and will teach you how to trade with Cryptocurrency from A to Z, whether you are a beginner or an experienced trader. This trading guide is featuring the Plus500 trading platforms, and uses it to demonstrate the basic terms and actions relevant to Crypto trading, but is relevant as well for all other brokers’ trading platforms and websites. The Plus500 trading platform is available to traders in a ‘Demo Trading Mode’ and a ‘Real Money Mode’. There are multiple digital currency financial instruments available to traders including the following: Bitcoin, Bitcoin Cash, Ethereum, Litecoin, Ripple, Dash and NEM. Each digital instrument has 2 options available: ‘Short’ or ‘Buy’. 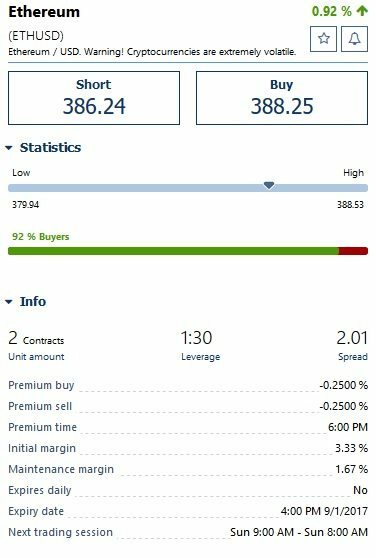 The ‘Buy’ price is always higher than the ‘Sell’ price for these financial instruments on the Plus500 trading platform. Do you want to buy or sell the financial instrument in question? If you want to buy, click the buy button, and if you want to sell, click the short button. The buy button indicates that you are going long on the price of the underlying asset (you believe the price will rise, while the short button means you’re going short on the financial asset, meaning that you believe the price of the cryptocurrency will fall. Whether you are going long or going short on the underlying instrument is based on your assessment of market conditions. Geopolitical uncertainty (political tensions, bellicose talk, economic instability etc.) tend to push traders towards buy options, while a calming of tensions and a movement of capital towards equities markets tends to reduce demand for digital currencies. If you decide to buy Bitcoin, you simply choose the instrument and click the buy button. The trading platform allocates €50,000 in demo trading funds. When you buy, the minimum amount of the contract is 0.25 units which is 25% of the current rate of BTC per unit. At the time this contract was initiated, the current price was $4,702, and 0.25 units was the equivalent of $1,175.76, or €992. The minimum contract size you can purchase is 0.25 BTC, and after leverage has been considered, you will see the margin requirement – the actual cash that you will need to deposit to pay for the trade. In this case, the required margin is $39.22, or €33.11. When you’re satisfied with the size of your contract, click the ‘Buy Button’ to allow the platform to initiate the trade. Once you have initiated the trade, you will see your available balance listed at the top of your screen, and the amount of equity you have available. You will also see the profit/loss indicated on the far right of the toolbar. As your profits increase, the available profits will show an increasing tendency. Losses will also reflect accordingly. If you decide to close your position, you will know exactly how much you stand to gain, or lose based on the green or red profit/loss indicated for your trade. For example, if you close the position €4.57 in the red you will incur a loss on the trade and it will be removed from your list of open positions on the platform. Your trading balance will be updated accordingly. If you close a position in the black, the positive balance will be added to your available balance, and you will be able to initiate additional trades. 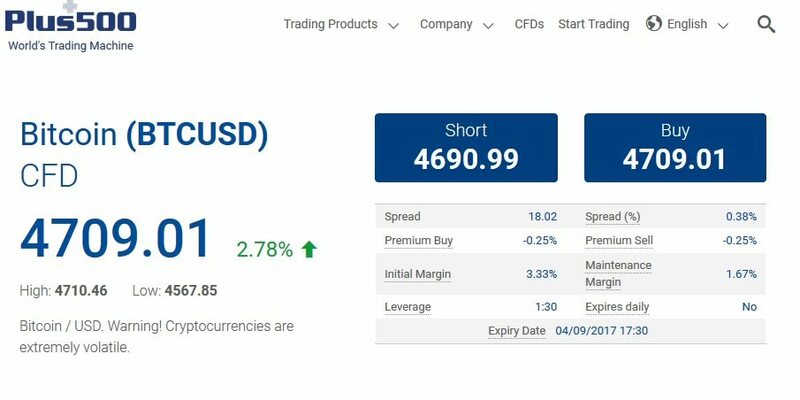 The Plus500 trading platform has a ‘Closed Positions’ tab where you can see all trades that you have closed out, and the net profit & loss that you have generated or lost. In a similar fashion, you can easily sell Bitcoin, Bitcoin Cash, Ethereum, Litecoin, Ripple, Dash, or NEM by clicking on the ‘Short’ button. For example, you can decide to short Ethereum by a taking out a minimum contract amount of 2 contracts with a margin requirement of $25.75 or €21.74 at a current price of $386.29. When you short Ethereum, you are stating that the forecast price will be less than the buying price. You can decide to close at profit or close at loss to protect your trades from being ruined. Once you have set your trade, click the short button to finalize the trade. Once again, you will see this current open position listed as a short position under the open positions tab. In all cases, your trades have an expiry date which is listed for you. On that date, the trade will automatically close out, and if you and in the money, you will profit accordingly. All cryptocurrencies had expiry dates at the time of writing (September 1, 2017). Traders are advised to contact customer support to ensure that this policy is still in effect when they are ready to trade. The expiry times indicate the precise date at which time trades will close out and profits or losses will be generated. 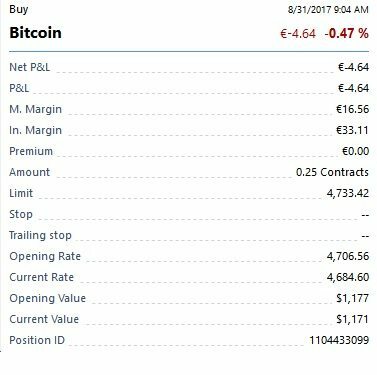 How is the BTC/USD rate or the BTC/EUR rate determined by the Plus500 trading system? Plus500 makes no bones about its safety and security features. The company is a trademark of Plus500 limited, which is fully authorized and regulated to offer real-money trading on cryptocurrency such as Bitcoin, Ethereum, Bitcoin Cash, Dash and Litecoin according to the Cypress Securities and Exchange Commission (CYSEC) with license #250/14. Plus500UK Limited is also fully regulated and authorized by the FCA (Financial Conduct Authority) with regulation number FRN 509909. In Australia, cryptocurrency traders can enjoy complete peace of mind, thanks to Plus500AU Pty Limited AFSL. In terms of client safety down under, the Australian Securities and Investments Commission safeguards all trading for clientele. Plus500 is 100% debt-free and the company has notable liquidity and capital reserves to ensure that it meets with statutory requirements in each of its licensed jurisdictions. The Investor Compensation Fund is required according to CYSEC for all Cyprus Investment Firms. The range of services covered by the investor compensation fund includes dealing on own account, execution of orders on behalf of clients, transmission of orders, and reception of orders. With negative balance protection, customers will not lose more funds than they currently have available in their account. This is safeguarded by way of the margin call feature, which prevents accounts from going into the red. It may occur from time to time that a balance becomes negative while you’re waiting for funds to be deposited into your account to maintain an open position. Margin Call may be indicated when Plus500 gives you a time within which to deposit funds into your account, or for you to close the position on your cryptocurrency trading. If you haven’t met your minimum margin requirements by the end of that additional timeframe, the position will automatically be closed out at the respective price at that time. Negative balance protection ensures that you cannot be plunged into debt if trades move out of your favor. It is always highly advisable to stick with fully licensed and regulated cryptocurrency trading platforms, since you have complete recourse in the event of non-payment, faulty trading practices, or malfeasance on the part of the trading platform or brokerage. CYSEC, the FCA and ASIC are your safeguards against shady brokerage practices, and Plus500 certainly operates above board in this regard. ‘Please be informed that our platform is protected by SSL (Secure Socket Layer), which is a Communications protocol that allows a secure and encrypted communication between different applications. 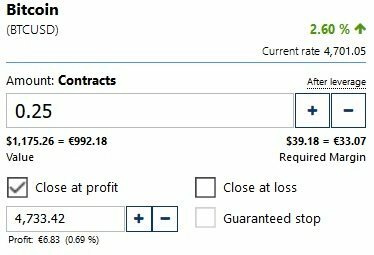 ‘Close at Profit’ – this checkbox allows you set the rate for an automatic closure of a position when you reach a certain profit. You can increase that profit figure by clicking the +, or decrease it by clicking the -. ‘Close at Loss’ – this checkbox allows you to set the rate for an automatic closure of a position to avoid bigger losses. It’s akin to the stop loss that you would see at a traditional trading broker. Traders must enter a number corresponding to your desired profit or loss figure. Cryptocurrencies have shown increasingly bullish tendencies in recent years. At inception in 2008/2009, Bitcoin was trading at mere fractions of a penny per unit. There was even talk of a Florida programmer who exchanged 10,000 BTC for 2 pizzas. By today’s standards, these would be the most expensive pizzas in the history of the world worth an estimated $47 million. At the time, 1 BTC was worth a fraction of a penny, and nobody expected it to hit stratospheric levels. By 2013, BTC went mainstream and spiked to $1,200 per unit in December, but soon retreated after the Chinese government banned new purchases of BTC. It then dropped to $700 per unit. Even at that rate, the pizzas purchased by Laszlo Hanyecz in 2010 would have had a street value of millions of dollars. The meteoric rise of BTC is less about the hype and more about the reality. BTC, BCH, Ethereum, Litecoin, Dogecoin and other cryptocurrency options (there are hundreds of them now) run on blockchain technology. This fully decentralized peer to peer network uses a secure, highly complex computer algorithm to run a digital registry. There are no individual nodes of failure on the system, and no single weakness can affect the entire network. In other words, it is virtually impregnable, and does not require any central authority to maintain its operations. Banks, financial institutions, retailers and other FinTech enterprises are using blockchain technology to process transactions quicker, cheaper, and more securely than anything else that currently exists. Digital currency also allows for the relative anonymity of trading activity, low cost structure, and no need for a middleman. These are inherently attractive to free trade exponents, and the enhanced security is appealing too. The current value of cryptocurrency (market capitalization is well over $150 billion) and many financial experts are anticipating that it could rise to over $2 trillion by 2027. Bitcoin is the world’s premier digital currency, and it also makes up the bulk of cryptocurrency market capitalization at $78.82 billion (at a trading price of $4,766 per unit August 31, 2017). While the price can fluctuate dramatically from one day to the next, digital currency trends have shown increasing bullishness over time. Consider that at the start of 2017, BTC was trading around $900 per unit and has spiked to over $4,700 per unit for a 5-fold increase. That is impressive, but it pales in comparison to the dramatic gains seen in the price of Ethereum which rose from approximately $8 in January to its current price of $380+ (August 31, 2017). The cryptocurrency boom is likened to the explosive growth of Silicon Valley in the 1990s. This is entirely possible, given that more countries around the world are now regulating cryptocurrency – Philippines, South Korea are examples – and huge trading volumes are now being seen in countries like Japan. Global capital markets currently enjoy investments of around $200 trillion. This encompasses assets across the board (Forex, indices, commodities, and stocks). Derivatives trading markets in digital currencies are the next big thing, and these will see explosive growth rates in demand for cryptocurrency like Bitcoin, Ethereum and Bitcoin Cash. In 2017, the USD has shown dramatic depreciation against the basket of currencies, as evidenced by the 10% decline in the US dollar index. This tracks the performance of the USD against 6 currencies, including the GBP, EUR, JPY, CAD, SEK and CHF. With a declining dollar, and decreasing confidence in fiat currencies, many traders and investors are seeking alternative investment options such as cryptocurrency to add to their financial portfolios. It is well within the realm of possibility that BTC could enjoy a market capitalization which is greater than Alibaba, Amazon or Apple Inc. This indicates that acceptance and adoption of digital currency is rapidly growing with major e-commerce platforms, retailers and as a peer-to-peer transactions method. 70% of all digital currency investments are currently found in Ethereum and Bitcoin – these are the key market players. There are approximately 800+ digital currencies on the market, similar to the volume of stocks on the NASDAQ, 2 decades ago. Bitcoin remains the go-to digital currency for most traders, despite the fact that it is not the most efficient blockchain technology system on the market. Consider that Visa, MasterCard, and American Express can process thousands of transactions every second, and Bitcoin’s current blockchain technology allows a mere fraction of that. Despite that, the current market supply of BTC is around 16.5 million, and it will be capped at 21 million. This limited supply ensures that increasing demand will raise the price of BTC. However, a caveat is in order: Regulation against cryptocurrency could pull the rug from under the market, but current trends indicate that more countries are accepting digital currency as the new normal, owing to the many benefits it provides for transactions purposes.